I had the privilege of growing up in a family that encouraged me to read the Bible and memorize Scripture. I remember memorizing passages of the Bible in Sunday School or Children’s Church even before I had the ability to read. I even diagrammed sentences in my school curriculum… from the King James Version! But one of my clearest memories of Bible memorization comes from my freshman year of high school. I was attending a Christian school at the time and in our Bible class through the course of the year, we memorized Jesus’ Sermon on the Mount – Matthew 5, 6, and 7. At one point I got in to a spirited discussion with the teacher his decision to change the grading standards for our Bible memory quizzes. For each word we missed, we lost 25% — meaning you could miss a few conjunctions in 5 verses and get a 25%. I argued passionately (albeit respectfully) that when the Bible talks about hiding the word in our hearts I don’t think it was meaning that degree of legalism – and quoted a few other verses along the way! While he didn’t change the rule that day (I don’t think he wanted to admit failure) a few weeks later it went back to the previous grading strategy where as long as we had the basic idea of the verse, we had minimal points deducted. While I didn’t agree with the teacher’s brief grading strategy, in retrospect I realized his meaning behind it. He wanted us to take memorizing the Bible seriously. As we look throughout Scritpture, I think it’s clear that knowing God’s Word is something we should take seriously “lest we forget” as we see happen over and over again to God’s people – and our hearts turn away from him toward the many idols of the world. Those words continued to repeat themselves over and over again, I couldn’t stop the refrain. They quieted my anxious heart and reminded me of God’s provision. If someone had asked me to quote them Matthew 5, 6 and 7 to them a few minutes before, I don’t think I would have been able to. But in that moment, the Holy Spirit spoke to me – using those words I’d hidden in my heart so many years before. Today, I can often forget how important it is to commit to memorizing Scripture, but it’s just as important today, as it was for that much younger version of me who argued with her Bible teacher, citing Scripture along the way. We don’t just memorize Scripture to gain knowledge or impress people. We memorize Scripture because we believe that God’s words are living and active – and he uses them to speak to us and conform us to his image. When we memorize Scripture, we recognize that the Word is living and active among us – that the same Word that became flesh can come alive in our hearts and lives and transform us – so we can reflect his glory, grace and truth. If you are interested in digging more into Scripture memorization, please consider joining our community of women at Do Learn Scripture Memory. Let all Israel repeat: What if the Lord had not been on our side when people attacked us? They would have swallowed us alive in their burning anger. The waters would have engulfed us; a torrent would have overwhelmed us. Yes, the raging waters of their fury would have overwhelmed our very lives. Praise the Lord, who did not let their teeth tear us apart! We escaped like a bird from a hunter’s trap. The trap is broken, and we are free! What if? This is a question that can cause endless stress and anxiety in our lives. What if I’d taken a different job? Married a different person? What if I’d kept my mouth shut instead of speaking up? Spoke up instead of keeping silent? Raised my children differently? We can drive ourselves crazy asking ourselves questions that there is no real way to answer and obsessing about potential past failures or mistakes. But there is a question we can always answer: what if the Lord was not with us? In the Psalms, David says that if the Lord had not been with the Israelites they would have been completely destroyed. Our answer to the question today may look a little different, but the principle remains the same. Without the Lord, we are capable of nothing. Although we might not see instant physical destruction, we are not capable of producing anything of eternal value. In the end all of the things we desperately seek to build with human hands are worthless if our hope is not firmly planted in Jesus Christ – knowing his sovereign plan if far greater than our human limitations. So today when we are tempted to ask the question “what if” in a way that causes us fear and anxiety, perhaps we should ask different questions. What if I lived every day knowing that God is in control regardless of the circumstances? What if I follow the Lord’s will instead of chasing after things that will fade away? What if I trust that the Lord is with me no matter what? As we answer the questions, I hope we are reminded that we can be free of the fearful “what ifs.” We are free because we know that Jesus came and took upon him the sin, injustice and brokenness of this world and overcame them. So we don’t have to wonder if we can have a personal relationship with Jesus Christ – we are given the opportunity to walk with him each and every day – knowing that He is the only place our help can come from. It’s been nearly 8 months now since I made the move back from China to the US. In some ways, it seems like my life in China is a distant dream. But in many other ways, it feels like the adjustment is far from over. It didn’t take long after arriving on American soil that I began to question the wisdom of moving back to the US during an election year. Election years tend to bring out the worst in people – and 2016 has been far from the exception. There are many things to be discouraged or disturbed about during this election season. From the candidates we’ve seen scandals, dishonesty, racism, sexism, and lack of integrity. From the American public we’ve seen many lose the ability to engage in civil discourse and resort to bitter and nasty conversations – both on and offline. Yet in spite of all of these discouraging things (and many more! ), that is not what bothers me most. What continually troubles me is when I see Christians, people that should be the forerunners of life, love, and hope, instead being the forerunners in anger, hatred, and despair. In too many conversations and Facebook posts, I see Christians sounding so much like the rest of the world as they lament the future of America (and often falling into an even greater level of despair). While I agree there are things to be concerned about, I wonder if we’ve forgotten our role as the church to be agents of change in our communities – not through political arguments, but rather through sacrificial service and love, even in the midst of persecution. I wonder if in our desperate fear for the future of America, we’ve forgotten that we serve a God who is far bigger than any presidential candidate’s ego. I’ve travelled and lived in places around the world where governments are far more corrupt than ours is, where Christian liberty is unheard of, and where people have little to no say in what their government does or does not do. While I’m certainly not saying that I hope our government becomes more like theirs, I would like to see our church learn from theirs – because in these places where Christians have all of the reasons in the world to fall into despair, they often have so much more joy and hope than we see within the walls of our churches. Over and over again in the Bible, we are admonished not to put our trust “in princes, in human beings, who cannot save” (Ps. 146:3). We are also reminded that God’s purposes are accomplished through even the most wicked rulers – and yet so often God’s people would forget this and once again turn to earthly rulers for their salvation. Sound a little familiar?! There can be many good arguments against either candidate of the two major parties’ candidates for president. I’m not addressing those here. But what I hope for each of us, regardless of whom we cast our votes for, is that we realize God’s purposes and plans will not be thwarted by the outcome of this election. I also hope that we realize in the midst of a nation divided, a time where this is so much darkness and despair, that instead of joining that chorus, we can sing a new song celebrating our hope is in something far greater. I love having people to my home. Some of my greatest memories are of meals with eight people crammed around my table (which definitely does not fit eight) eating and laughing together. I love having nearly 20 students crammed in my living room—playing games and I even love how somehow, in China, we almost always end up with a dance performance and suddenly I’m singing a solo or a duet (who knew Jason Mraz “I’m Yours” is such a long song?!). I’ll happily tackle the challenge of cooking big meals for dinner parties and coming up with random games for groups. For a long time, I was afraid to have people over to my home because of this. I grew up with the idea very much ingrained in me that a person’s house should be perfect. Sometimes I’d have people over and I’d constantly feel guilty. 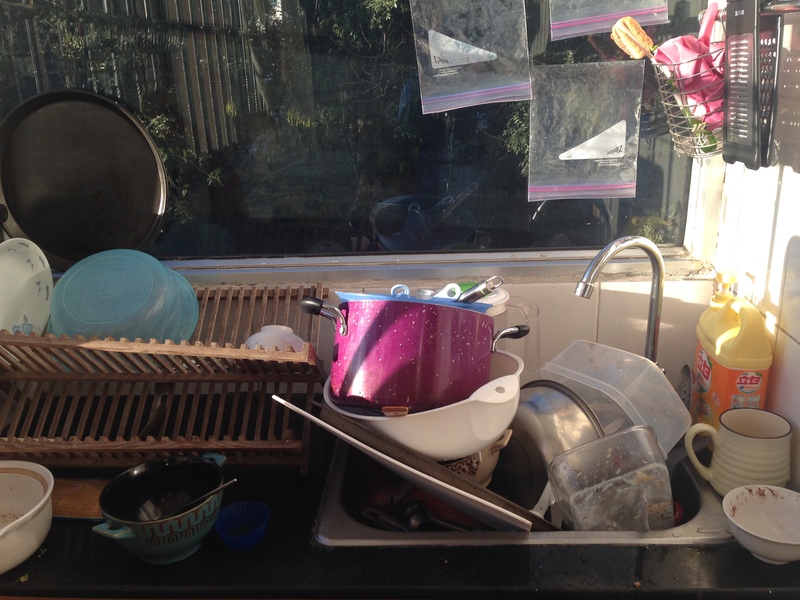 I’d wonder if my guests were thinking about the clutter in the corner. I’d wish my home looked “perfect.” I’d think maybe I should have waited until things looked better. But then I realized something, people aren’t looking for perfect. People are looking for real. People are looking to be invited into others’ lives. At least I know I am. If I waited for the moment when I was going to become the perfect housekeeper with a perfect house to let people in than I would never have anyone over. I’ve also realized there’s something special about inviting students and friends into my imperfect space—allowing them to see my humanity and my failures. I wonder how many of us are being held back in our lives in areas we are waiting to be cleaned up until others can see them. We are waiting for perfect—because surely others don’t want to see our imperfections. I often say vulnerability breeds vulnerability—but I don’t want to be the person who takes the first step. I don’t want to be the only one whose life is messy. Yet I realize that is where we experience true hospitality—the ability to be ourselves and to know that we can be loved, accepted and challenged for who we are. Whether it’s hidden behind a perfect mask or not, deep down we all have areas that are really messy and it’s when we allow each other into those spaces in our lives that’s when true community begins to grow. What are areas of your life that you are waiting for perfection in? When have you invited others into the mess with you? Compliments can be tricky, especially in a second language and sometimes they come out a little different than intended. (Okay, sometimes in our first language too. Like the time I told a Harvard alum I used to be impressed when I met people from Harvard…until I met him. It had sounded so different in my head.) But I’m frequently amused by compliments I receive from students. But the conversation that stands out is one that happened as I ate dinner with a couple students, and my age came up. This of course led to the inevitable topic of my singleness—and of course their concern about my age and my singleness as I’m pretty close to the bar for spinster status in China. This idea was further reinforced a few days later in a conversation with a colleague who commented her sister was going to have a hard time finding a husband now because her beauty was beginning to fade. As I once again reflect on beauty, I’m reminded of the words of Proverbs that charm is deceptive, and beauty (at least the outward kind) is indeed fleeting. And yet, if I’m honest, the way I live is often not that different from these words. Although I often decry a culture that puts outer appearance above a woman’s intelligence, skills and abilities, if I’m honest I can be part of the continuing trend. We compliment each other on clothing, on our bodies, on outward things far more often than we compliment each other for our spirit, our courage, our hearts, our minds. As I’ve said before I certainly don’t think we can’t compliment one another’s appearances or care about our appearances. It’s okay that we notice cute clothes or shoes. But it’s about where we place our value—what we tell others they are valued for. A challenge to myself and to those around me to think about our words and compliments. As you compliment your friend on her new haircut, are you also mentioning her courage in changing career paths? As you compliment your friend on her weight loss, have you also noticed that she has grown significantly in compassion and grace? As you compliment your friend on her stylish outfits, are you also complimenting her on the wisdom she brings to your daily life? Our words have the ability to take away courage, strength, hope and confidence—but they also have the ability to give it. There are small ways every day can we encourage a woman that she is still pretty…in the ways that truly count. I love to cook. I was trying to recall exactly when this happened—if there was some moment, or dish that pushed me over the edge. I’ve never disliked cooking, and I do remember experiencing slight devastation when my mom decided we should get rid of my play kitchen as a child (which in actuality rarely played with, but I didn’t do change well) and my mom encouraging me with the assurance that I could play with her Tupperware. I also remember being the most knowledgeable cook of my college roommates…but perhaps that wasn’t an incredible feat (yes, yes, if you’re reading this you know I love you—and that we’ve all come a long way since). But I feel like it’s in these past two years of living in China that my “like” and even “enjoyment” of cooking has become more of a deep abiding love. There is something about food in a foreign land that evokes a sense of home, a sense of belonging—and for me a sense of accomplishment even in the midst of chaos. Even when little else around me makes sense, I can go to the kitchen and I can create something new. About two years ago, when I was newly arrived in China, I found a “quick and easy” recipe for some sort of broccoli chicken cheese bake. It had a banner advertising “30 minutes or less.” Now, even in the best of circumstances, I often find suggested cook times given on recipes can be a bit on the not-so-generous side. Insert: China. First off, for those of you who don’t know what we’re dealing with—my kitchen consists of one gas burner and an approximately US-sized toaster oven (it tightly fits a 9 X 13 pan and was one of my earliest big purchases!). As I began to go through the recipe I realized some problems—ingredient one: can of cream of chicken soup. I didn’t have one of those. I then Googled—“homemade cream of chicken soup” (And found this great recipe…which I managed to ruin the first time and had to make a second time). This process of Googling substitutions or improvising happened at least 2 more times. And voila, more than 2 hours later, the quick and easy broccoli chicken bake emerged. And I took a bite…and I thought, “This might be the best thing I’ve ever tasted.” Now, it’s entirely possible at this point, I may have been so hungry the little crushed piece of broccoli residing amidst the muck on the floor may have also been tasty, but there was also a sense of having overcome many obstacles—to ultimately prevail. Maybe for some it’s not so appealing, but I love the adventure of not being quite sure what the final product will be. When I first arrived in China (and let’s be honest I didn’t really fully know what I was talking about yet), I wrote about the goodness of the daily struggle. What’s the English saying? (Yeah, I tend to forget those). Something like “the harder the battle, the sweeter the victory.” That’s what I’ve learned in the kitchen. The continual challenges brought to me by cooking and baking are always bringing opportunities for new victories (and sometimes opportunities to crash, and quite literally burn—like the time I managed to unsuccessfully make 2 rounds of strawberry cupcakes—which were quite valuable in expensive imported ingredients…and I probably can’t count the number of times a large cloud of smoke was billowing out of the kitchen). But the success goes beyond personal sense of accomplishment. It’s also here in China, I’ve learned about the real power of food. If I were to think back on my life before now, I would note that many of my good friendships emerged over sharing meals together. My college roommate Stephanie and I moved from roommates to dear friends as we bonded over eating Mexican food whenever we could. Another friend and I bonded over visiting new ethnic food restaurants. But even more so now, I realize the degree to which food brings people together. It’s true in Chinese culture—but it can be true in any culture if we have the time and space. There is something about sitting down together at a table with friends and trying new (and sometimes weird) dishes, eating food that’s so spicy we’re all near tears, or eating your favorite holiday dishes from America that brings you together. There’s something about my students exclaiming excitedly to each other when I have baked them cookies (and trying to discourage them from eating so many they’ll feel sick) that brings such joy to my heart. Cooking not only brings me on adventures, but it also gives me an opportunity to go on shared adventures. I always say I’m going to start a food blog, so we’ll see if we can start here. 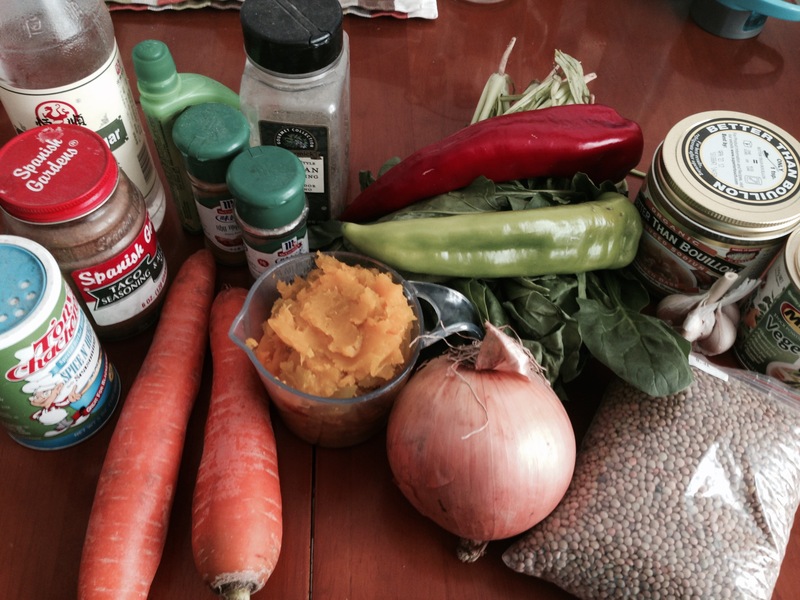 So here’s a recipe for lentil soup I recently made (with notes for those of you cooking overseas). If you’re in America, there may be some adaptations to make this easier for you. Here’s the ingredients minus the tomatoes which were soaking in hot water to remove their skins. I used curry powder, black pepper, some Italian seasoning blend I have, some Cajun seasoning and some taco seasoning (because I was out of cumin and it’s mainly chili powder, cumin and onion). You can use what’s available to you or check out the original recipe for what she did. Most of these ingredients can be pretty easily bought in China. I used one of the spicier red peppers and spicier green peppers–maybe a bit overdoing it. If you don’t like spicy you might go with a traditional bell pepper of each color or one of the spicier green with a traditional red bell pepper. I do bring organic Better than Bullion Chicken stock back from America and buy vegetable stock powder at Metro (a large import store), but if you don’t have access to stock for some reason (other than the MSG/sodium combo they sell at the supermarket) you can make it yourself fairly easily. If you want this recipe to vegetarian you can just use vegetable stock but I like the flavor the chicken stock gives. The vegetables cooking in olive oil. Somehow I managed to burn myself when dumping in the vegetables and the olive oil splashed in my face. Food safety, everyone. Don’t stick your head right over the hot oil when pouring. My new favorite thing is to add a whole pumpkin to things. After cutting the small pumpkin into about fourths, you can steam it (I use my rice cooker) or roast it in the oven (face down on a cookie sheet with foil and a little oil spread on the surface). 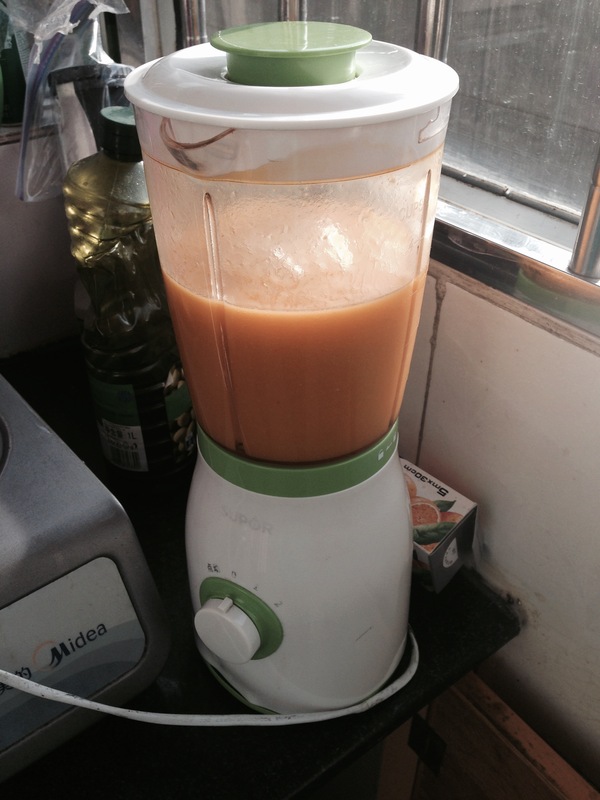 I then blend it right up in my blender with chicken stock. You really can’t tell it’s there, but it’s a great healthy addition! All of the stock (chicken/pumpkin) and vegetable are added to the vegetables along with the lentils…and let it cook! I missed some pictures along the way, but after the lentil are soft you can blend part of the soup then add it back in for thickness. Then add greens, parsley and lime/lemon juice. I decided to sprinkle a little fresh parmesan on top. Kind of odd perhaps, but tasty. 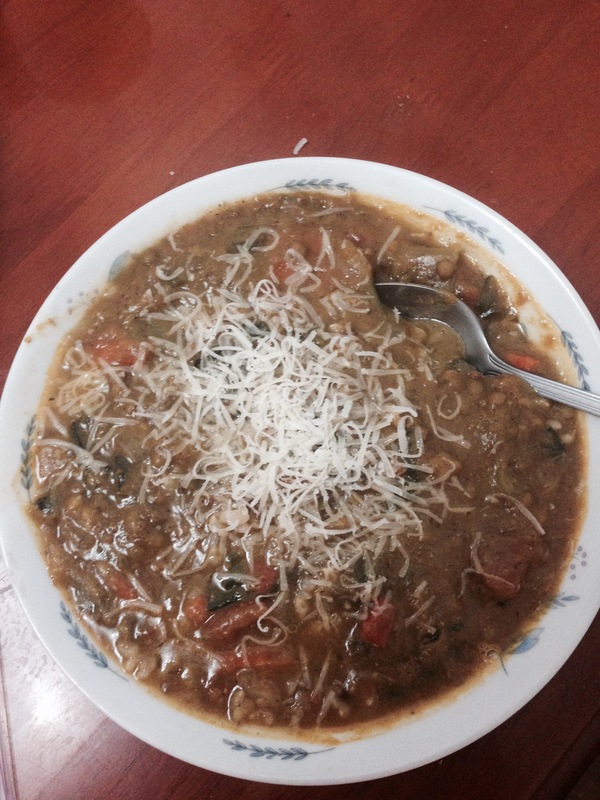 A delicious, thick hearty soup chocked full of vegetables and nutrients. It was a bit spicy so I served it to my Chinese friends with a little whole grain rice. Warm the olive oil in a large pot over medium heat. As the recipe said 1/4 cup olive oil may seem like a lot, but it really helps to bring out the flavor in the soup. Add the chopped onion and carrot and cook, stirring often, for about 2-3 minutes. 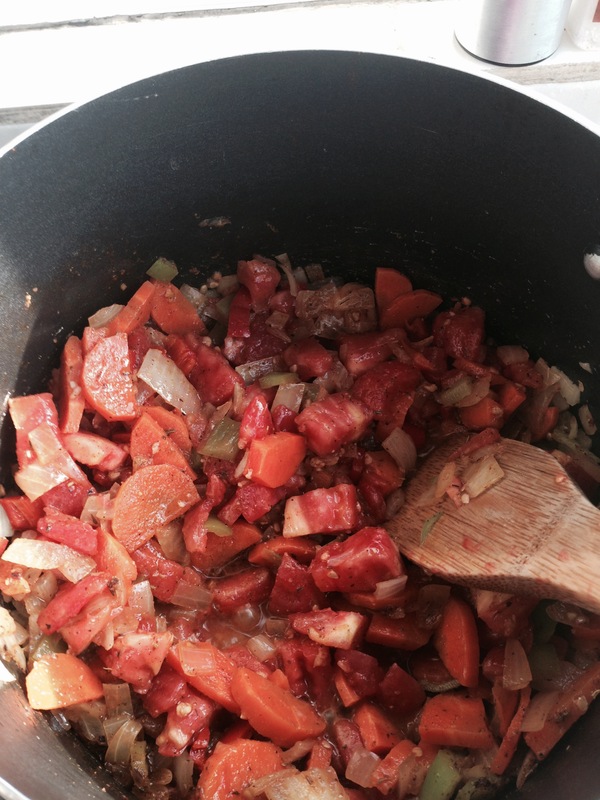 Then add the red and green pepper and cook for 2-3 minutes more. Add the garlic and other dry seasonings you chose (taco seasoning, cajun seasoning, curry, Italian, etc.). 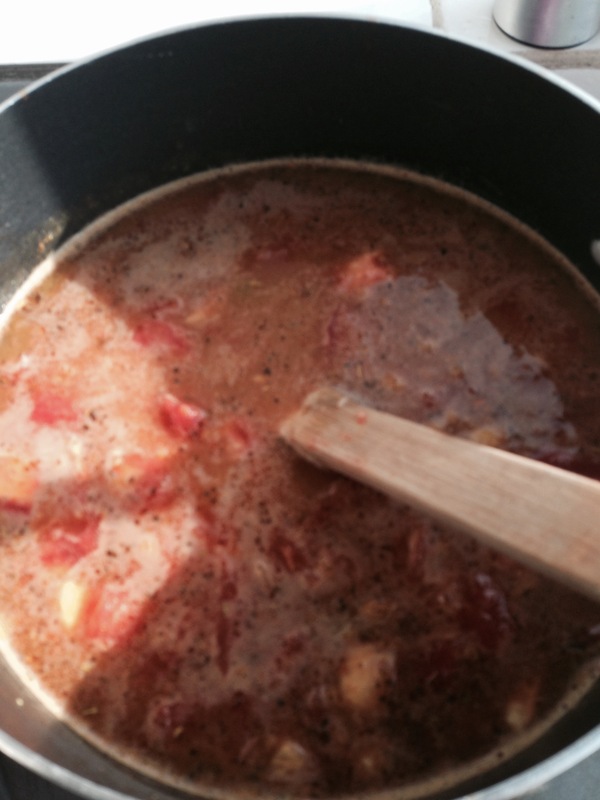 Pour in the peeled/diced tomatoes and cook for a few more minutes, stirring often. Meanwhile, blend the pumpkin with about 2 cups of chicken broth. The pumpkin should blend completely in resulting in a slightly thicker broth. Pour in the lentils, broth, broth/pumpkin mixture and the water. (If you are not using Cajun seasoning you may want to add salt, but I didn’t because the stocks and seasoning have quite a bit of salt.) Add black pepper. Turn up the heat and bring to a boil. Then reduce heat and partially cover. Cook for 30-40 minutes, or until the lentils are tender but still hold their shape. Transfer about 3 cups to the blender (maybe more). Be careful to make sure you don’t splash yourself with the hot soup. Pour the puréed soup back into the pot and add the chopped greens. Cook for 5 more minutes, or until the greens have softened to your liking. Also add chopped parsley. Remove the pot from heat and a couple dashes of lime juice. Taste and see if you need more seasoning! As this school year begins, my mind wandered back to another first school year more than half of a lifetime ago. It was my sophomore year in high school, and I had just transferred to a new school—an all-girls Catholic school where the only people I knew were a few neighbors who were more acquaintances than friends. Up to this point my combined “real school” experience (I had largely been homeschooled) was a little over a year in a tiny classical Latin Christian school and another 2 years at a small Christian school. I was naïve and a bit bewildered by new surroundings—but it was also the first time I felt like I had experienced a true calling. One of the girls in my class almost instantly befriended me. I was awestruck by her. She was beautiful and vivacious—pretty much everything I wanted to be—and she wanted to be my friend. I would go home from school and sing praises about this seemingly perfect girl. Her quick friendship affirmed to me that this indeed was where I was supposed to be. And then the day came. I leaned over to pick up a piece of paper that fluttered to the floor under my desk. I began to read the note—the lines blurred together as I absorbed the mean words written about me by my newfound friend. I don’t remember much of what it said—but even now when I recount the story it’s hard for tears not to well up as I remember the pain that pierced my heart. I made it through class in a haze and rushed to the bathroom where I took deep breaths and attempted to choke back the sobs rising up in my body. I went to the next class—where I once again was seated next to my “friend.” She asked for help with her homework—and somehow I managed to help her as if nothing was amiss. But what most stands out to me as I think back on this story—even as I recently recounted it to my dear friend and teammate Chelsea is the feeling that rose up in me for so long as I thought of it—that still lingers now. The reason I didn’t want anyone to know I was upset. The reason I didn’t want to tell my family. The reason I was almost more embarrassed than relieved when the girls apologized to me. The reason it took years for me to ever speak of this moment to anyone else. I was afraid that if I told the story that others would see what had apparently been so obvious to those girls—that I wasn’t enough. That I was imperfect, flawed, undesirable. 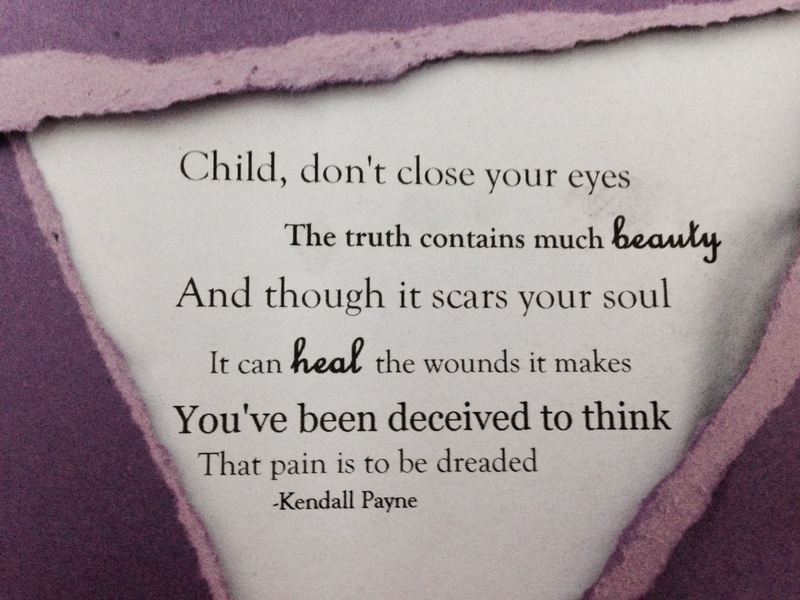 But if I kept it hidden perhaps I could also keep that imperfection hidden. I was so certain when I walked into school 15 years ago I had been called—called to change lives and transform souls. I’m still confident I was called to that place at that time, but perhaps for much different reasons than I expected—perhaps it was much more about the transformation of my own heart and soul than the transforming of others. It was during those years I learned I would never be perfect, but that’s okay because there has only been one perfect person. It’s when I learned to look for and love those who were living on the margins of society. It’s when my heart began to grow beyond myself to see a bigger story. I recently found a journal from around this time, in which I boldly proclaimed my life’s goal would be to make sure those around me would know they were loved, accepted and valuable. I can’t say I’ve lived up to that lofty expectation. But I know as I wrote this (with tears inexplicably streaming down my cheeks at several points), I can truly say I am so thankful for that moment and for others like it. I bear no ill will against those girls—because they like me were insecure, imperfect high school girls just like me trying to find their way. Instead of looking back at the moment today and being paralzyed by shame, it is grace that now overwhelms me. Grace in learning I will never be enough—but I don’t have to be. Grace in knowing I can love others who are imperfect just like me—because of the one loved and chose me in my imperfection. Grace in seeing that even when I am called to difficult things a thread of redemption and hope far greater than I expected is often at work. And that is something that I can be thankful for.